I sold one of my Stratocasters and decided to use the proceeds to purchase a classical guitar. Here’s the story of that purchase. How well can I follow my own advice on how and where to purchase a classical guitar? First, the guitar I decided to get wasn’t among those I had previously mentioned as my front runners for a classical guitar. Not a good start. Here’s what I decided on and my reasons for the selection. I decided on a Cordoba C7 CD/IN classical guitar (cedar top, Indian Rosewood back and sides). The guitar has laminated back and sides instead of solid wood. The guitar has a solid cedar top instead of solid spruce. The guitar has a rosewood fingerboard instead of ebony. The guitar comes with a gig bag instead of a hard, humidified case – but I can obviously purchase a better case at any time. The price I paid for the guitar is under $500 while my 3 top choices listed previously were all in the $900 to $1000+ price range. Why did I change my mind? I’ll start with price first. This one is easy. I’ve never owned a classical guitar before. I’ve been a steel string guitar player for over 50 years. A thousand dollars for a guitar I might decide I don’t really like seems excessive. Particularly when I consider the cost of a better jazz guitar – something I know I like and have always wanted. Shouldn’t I go with my strengths? 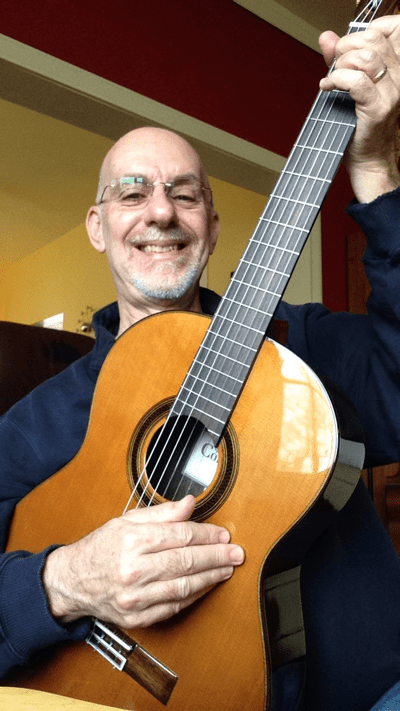 I decided I would attempt to live with a less expensive classical guitar and if I really loved it, I could always upgrade later – but save my initial investment until I knew classical was the way for me. I discovered settling on a relatively inexpensive classical guitar was more difficult than I imagined. I visited a local music store and tried out a Yamaha CG-162c classical guitar. This model has a solid cedar top, rosewood fingerboard and Ovangkol back and sides. Ovangkol is often used as a substitute for rosewood. The guitar sounded OK when I played it but not “oh my god” wonderful. I checked the action with my trusty Stew-Mac String Action Gauge and the strings were a bit too high but not excessively so. The guitar doesn’t come with a case or even a gig bag. I would need to buy something for it. I convinced myself I could live with this guitar but I wasn’t excited about it. The street price for the CG-162c is about $350. Then I went to the Guitar Center and tried other less inexpensive classical guitars. Guitar Center sells Yamaha classical guitars online but had none at my local store. They did have Cordoba classical guitars. I tried the Cordoba C5 first. It has laminated mahogany back and sides and a solid cedar top. The price is $299, so less that the Yamaha CG-162s. It was immediately apparent that this guitar felt and sounded superior to the Yamaha. I checked the action at the 12th fret and found it was within the specifications Cordoba lists on their website. I might have been done after trying the C5 but a C7 was hanging next to the C5. I decided to try the C7 again. Wow! The tone was significantly better to my ears (it is a preference – you might like mahogany). I felt it was worth the increase in price. I was still saving over $500 from the C10 which was on my original list. A few other things helped convince me. First, Guitar Center was having a sale and I saved 15% from the normal price. Thus the $500 guitar cost me $425. Second, the guitar includes a gig bag. Even most inexpensive classical gig bags cost at least $50. Finally there was the setup. Both guitars had action within accepted norms and within the published specs from Cordoba. I had been looking at another local music store a few weeks ago and asked the owner if she did free setups on the Cordoba guitars. The store is an authorized Cordoba dealer and I knew from past purchases that she does include setups. But it never hurts to ask. I was surprised when she told me they don’t need to do setups on their Cordoba guitars because they are setup at the factory. My sample of two measurements at Guitar Center indicate this store owner may be right. I’ll find out (below). As for the other specifications I’ve changed my mind on, the only one I may regret is a spruce top. Everything else is a reasonable compromise considering price and that this is my first classical guitar. I wrote in “How to buy a Classical Guitar for under $1000” that the first thing you should do if you buy online is check your guitar vs a New Guitar Checklist I provided. Most of the big online retailers including the Guitar Center allow you 30 days to return the instrument if you aren’t satisfied. So after my guitar arrived from Guitar Center by UPS, how well did this Cordoba C7 do against my checklist? Physical inspection for following found no problems. All OK.
Any imperfections or dings, nicks in wood? I took photos to be sure of initial condition even if though I found wrong. I photographed the guitar as if I was trying to resell guitar on Ebay. Tuners worked smoothly with no slack or binding. Action = Relief at mid point. There was relief. I did not measure the amount. 6th string: ~ 0.140+ inches ~ 3.6 mm ( .145 ~ 3.7 mm) ~ 9/64″. Cordoba spec is 3.5 to 4.0 mm. OK. I played notes chromatically from 1st to to the end of the fretboard on each string. Buzzing can be either high frets or loose parts so I played loud and soft, single notes and chords and listened for different types of buzzing. I discovered buzzing on 4th string at and above 4th fret. This corresponded to high spots along 4th string at about 13th fret. I improvised a “Fret Rocker” to check for high spots beneath the 4th string. See Stew-Mac for how to do this. Essentially you set a straight edge to span three frets. If the center fret is higher than the other two you can rock the straight edge back and forth. I found frets 13, 14 and 15 to be high beneath the 4th string. Finding the frets in the vicinity of the 13th high makes sense if buzzing is detected when fretting at the 4th fret because the 13th is near the middle of the fretted string where the maximum vibration might be expected. Subjective evaluation: everything seemed good except for fret buzz. The guitar felt comfortable and easy to play. I followed my own advice and returned the guitar to my local GuitarCenter. I called their customer service number but was told I did not need a return authorization if I was returning it to a local store. I was also asked if I would re-order the guitar from them since I told them it was defective due to buzzing. I asked them if they would check the next guitar I ordered before sending it to make sure the setup was done properly and there was no buzzing. The customer service representative told me it costs too much for them to do that even though he knows others such as Sweetwater do that. The local GuitarCenter was helpful and gave me a refund without any hassle. Because I had paid by PayPal, by the time I returned home the refund was in my account. I ordered the same guitar, a Cordoba C7, but this time from Sweetwater.com. They do a 55 point inspection and insure the guitar is setup to factory specs. The order was placed on a Wednesday and the guitar arrived Saturday by Fed Ex. There were some differences immediately apparent when I compared the Sweetwater shipment to the shipment I had received from Guitar Center. 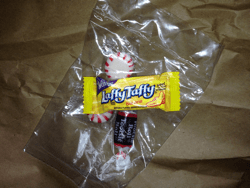 First, Sweetwater included a bag of Candy (“Sweet”) in the outer packing box. More importantly, the guitar from Sweetwater was double boxed with the guitar packed in its gig bag inside the inner box. This is the way it should be packed. 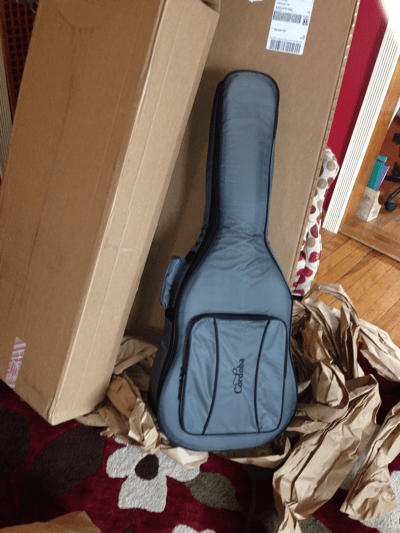 If the guitar is shipped in a hardshell case you can skip the inner box, but a soft case such as the gig bag that came with the C7 isn’t enough protection for shipping the guitar. Guitar Center skimped on the packaging and only used an outer box to hold the guitar in its gig bag. 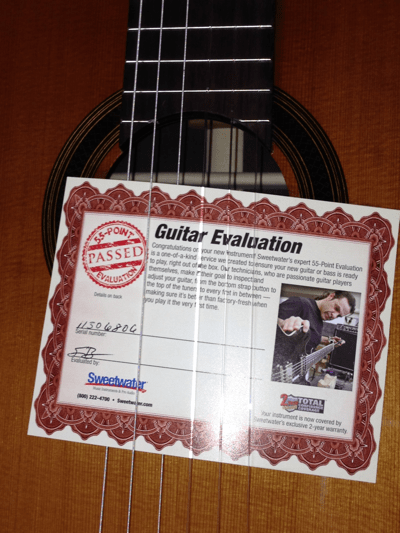 I checked the Guitar from Sweetwater against the New Guitar Checklist as I had for the first guitar from Guitar Center. This time I’ll just report the differences. The important measurements were the action at 12th fret. I measured 5/32″ or ~ 4 mm on 6th string. That’s in spec. 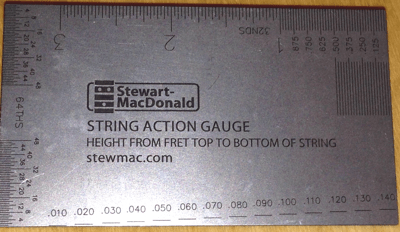 The 1st string measured 0.120″ or ~ 3.05 mm which is also in spec. The action on the Cordoba C7 from the Guitar Center was actually too low on the 1st string (see above to refresh your memory – or maybe you don’t have too. Remember I’m writing this 3 days after I had written up the first guitar). I checked for fret buzz and only once heard any – and that turned out to be due to sloppy technique on my part. When I replayed the notes on the frets, paying more attention to technique, there was no fret buzz anywhere. To be sure I checked for high frets using the 3 fret straight edge, rocking technique I had used before. The frets were level everywhere. I was very impressed with the service from Sweetwater.com and based on this transaction would highly recommend them. Although I paid the going street price (as opposed to saving 15% due to a Columbus day sale), I think having a properly setup guitar is worth paying the going price. I still have 30 days to evaluate and make up my mind but should I decide to return the guitar it won’t be because of a bad setup. I’d only return it if I decide the cedar top was a wrong choice or maybe the whole I need a classical guitar was wrong. Nah? Day 1 of the 30 day evaluation period – and I’m liking this guitar.